Recently at the Asia-Pacific Association for International Education (APAIE) 14th Conference and Exhibition held in Kuala Lumpur, Malaysia, influencers in ELT came together to discuss how quality assurance across the region is helping identify and highlight best practice in English language teaching. “Bringing together senior teachers, managers and business owners to share their best practices in externally benchmarking their quality in English language teaching in their centre and their country helps us move towards more harmonious collaboration between ASEAN countries and Australia” says Patrick Pheasant, Chief Executive Officer of NEAS Australia, the leading independent Quality Assurance in ELT specialist in the Australasian region. Mahidol University International College received their quality endorsement also in March 2019, making this centre the first to join from Thailand and be accepted amongst the 200 centres endorsed by NEAS throughout Australia, Malaysia, Vietnam, Indonesia, Cambodia and Singapore. “Undertaking NEAS quality endorsement provided an opportunity for us to identify what we were already doing well, and what we could do to improve in our quality management systems,” said Dr Alexander Nanni, Associate Dean for International Affairs at Mahidol University International College. The panel held at APAIE focused on ways to build on ASEAN Australian best practice in English language teaching and concentrated on discussion around developing minimum quality standards for ELT teachers across ASEAN, in order to help establish teacher mobility and professional development across the region. 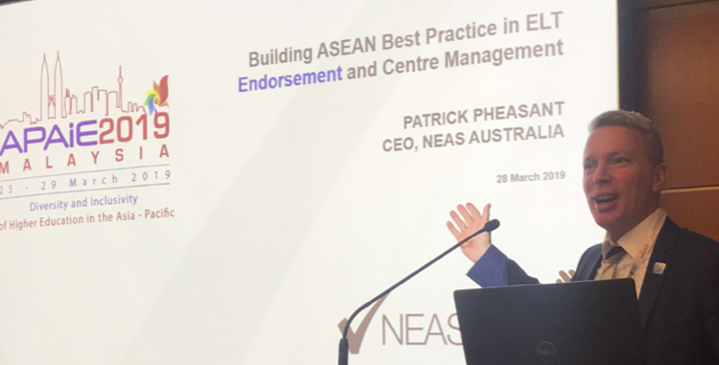 In the last four years, NEAS Australia has helped many of their Australian member universities, schools and independent language centres build transnational partnerships and offshore centres with countries in the ASEAN network. By endorsing select centres in the region, NEAS is opening the doors for Australian ELT providers to build stronger and longer pipelines for recruiting their students. This panel at APAIE 2019, builds on a long-term strategy by NEAS Australia to build bridges between ASEAN and Australia, that are of mutual benefit to the organisation’s Australian and ASEAN members. Michael Fay, Director and Head of Education Services, AFG Venture Group, who chaired the panel, supported the work of ELS Malaysia, Mahidol University International College and ELC Malaysia in conjunction with NEAS Australia, stating that “NEAS has built on its work over the last 30 years in developing, maintaining and reinvigorating ELT standards in Australia by extending this to our ASEAN neighbours. This closely aligns with recent multilateral agreements between ASEAN-Australia such as the ASEAN-Australian Summit in 2018 and the ASEAN-Australia Education Dialogue in Penang in Malaysia in 2018, he said. NEAS Australia further extended its charitable activities to the region earlier this year with support of the CamTESOL NEAS Regional Leadership Forum in Phnom Penh, Cambodia in February 2019. This workshop was delivered in a blended learning format to more than 100 emerging and experienced leaders in ELT and explored ways to develop leadership capacity in ELT centres and share insights and best practices across the region. Participants from this workshop were invited to participate in an ongoing online course Leadership in ELT developed by NEAS that has connected teachers, managers and professional staff across Australia and the ASEAN region, which is open for registrations throughout 2019 for interested senior teachers and managers. This year’s NEAS 2019 ELT Management Conference, held in Sydney at Doltone House 8-10 May 2019, is focused on Leadership in ASEAN and Australia and Influencers in English Language Teaching. This is a must attend event held every year with more than 300 managers and senior teachers attending the three-day conference. Tickets always sell out, so register today to avoid missing this key international event.